Well Godzilla was a classic compared to the mess in my office. In this post I decided to give you a glimpse of a good deal of my world … my office. Supplemented by some photo illustrations. I just received, through the graces of Carisse Berryhill of the Center of Restoration Studies, a complete set of the Millennial Harbinger (42 volumes)… what to do with them? Here is a view to the right across the top of my desk. An attempt to capture the mess. This entry was posted on Wednesday, July 30th, 2008 at 9:22 pm	and is filed under Bobby's World, Books, Tucson. You can follow any responses to this entry through the RSS 2.0 feed. You can leave a response, or trackback from your own site. The poster’s all wrong– Campbell would have been smart enough to protect his assets with a helmet. Really though, how can you call that a mess? It’s a casually arranged collection of books. would you call a pile of diamonds a “mess”? No way. Books couldn’t possibly be considered a mess. That’s beautiful, BobbyB A messy mind is a sure sign of creativity. That’s what I try and tell myswlf anyway! It really doesn’t look that bad. You are probably like my son Isaac who says, “It may look like a mess, but I know exactly where everything is.” If I am really honest, he gets some of it from me. Have a great rest of the week. Focker Campbell disciple…… Forget the mess..that’s some library you have. I have a book or two. Some more at home but they are in the garage at a house I don’t live in any more. whatcha need is an earthquake,bige nough to blow all that right off the wall. AND THEN a LITTLE restoration project. I’m jealous, very cool that you got a complete set of the Millennial Harbinger (42 volumes). Do you have a copy of Campbell’s Living Oracles? I’m always on the lookout! I know you can get it on cd, but I want an original! Bobby–just finished listening to your Pepperdine stuff. Thanks for some great presentations, especially flying solo (did you have a PPT graphic where JMH bobbed his head in agreement?). If you had a handout I’d love to get a copy if you wouldn’t mind sending it. 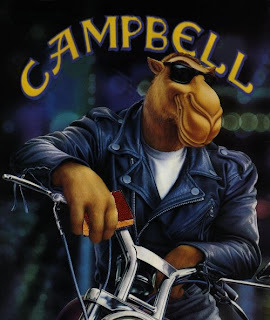 As to this post, I never saw the camel/campbell coming!